In partnership with the Museum of Geraldton, Euphorium Creative is proud to present ‘An Incompetent Life’. Anyone who loves a tale of adventure, tragedy and raw life truths will love Brian Poller’s An Incompetent Life. It tells a story that spans from early life as a six-year-old in rural England through to the unnecessarily traumatic changes brought on by a decision to emigrate to Australia and become ten-pound poms. Under the roaring Australian sun, a boy fast-becoming a man searches for his own identity in a country of immigrants that in many ways is searching for identity itself. The performance is driven by humour with a dash of pathos and a splash of the absurd - making it a positive outlook on what it’s like to be an immigrant growing up in Oz. Brian’s storytelling ability is incredibly engaging and will have audience members hanging onto his every word. What makes Brian even more inspiring is his ability to tell a good story and perform live while tackling his speech impediment. His tales of growing up are relatable in so many unfortunate ways. Hear how his look on life is slightly different to most and how he uses his incompetence to gain success – or at least one version of success. Find out what the ‘Red Rubber Thing’ has to do with loss, why reticulation can only be managed from the inside, and a few other things that can’t be mentioned here due to….er……incompetence! Get ready Geraldton, because the ultimate battle of MC's has arrived! No rehearsals, no scripts, just 100% improvisation at it’s finest. This uber-engaging show has 5 epic rounds packed with audience participation. One of everyone’s favourite rounds is called “Pick Up” which involves coming up with pick up lines for audience members. The truly unmissable Comedians vs Rappers will take place at The Gerald on the 17th of August. Doors open at 7pm and show starts at 8pm. Early bird tickets are $20 (offer ends midnight 25th July) and tickets at the door are $30. This event is 18+ and proudly presented by Euphorium Creative, formerly known as The Comedy Emporium. The Comedy Emporium and Relay for Life Midwest are sorry to have to inform you that we have had to cancel the Comedy for a Cure show which was due to be held on Saturday 23 September in Geraldton. Following a review of low ticket sales and our struggle to find performers on the long weekend, it is with a heavy heart that have had to cancel the charity event. We would like to apologise for the cancellation, especially to those of you who have already made plans to come and have bought tickets. We are very disappointed, but please be assured that all tickets purchased will receive a full refund of the price purchased. Anyone who won tickets as prizes or similar, is invited to contact us by email to discuss use of their tickets in the future. The Comedy Emporium is now looking to work with Relay for Life Midwest to help raise vital funds for cancer research in other ways and we encourage everyone to continue to dig deep and support Relay for Life where they can. Our Friday 16 June show has moved due to unforeseen circumstances (it’s really that we just wanted to keep up with the latest trend of secret location events..) Thanks to the quick response of the QPT our show will be RELOCATED to an underground backstage show at the Queens Park Theatre - Don’t worry we are bringing Tarts and Co’s food with us so you can pig out in the dark. Now this is important... we have to be stealthy so we can’t just use the front door - entry is through the secret “Stage Door” off Maitland Street, the main foyer will be closed. Therefore parking will be best in the QEII carpark, rather than on Cathedral Avenue. Please note, dinner supply is now limited - if you’ve pre-ordered yours it will be delivered at 7.00pm. You can pre-order with your ticket purchase until 8pm tonight (Thursday)! If you want to buy on the night, you better get in early! You can still get tickets but they are limited. Tickets are $10 cheaper if you pre-book online! Doors and bar open 6.30pm, live music from 7pm, comedy starts at 8pm. Witness the Kalgoorlie City Markets Arcade as never before as it comes alive for a night of fun and festivity. Enjoy live local music presented by Eleven13 Records, stand up comedy from The Comedy Emporium, and script reading of Zack Inglis’ locally produced feature film while having a tasty beverage from our own Beaten Track Brewery. Later that night we are going to get our dancing shoes on as we turn the arcade into Tomas Fords very own Crap Music Rave Party. Be part of the transformative energy that is Heartwalk. This is an 18+ event. Tickets for entry is required for all free and ticketed areas and shows. An afternoon and evening of Comedy Improv! Featuring some of Geraldton's funniest comedian improvisers. These "April fools" will have you crying with laughter until your sides hurt. This is a family friendly shows, so bring your family along and enjoy the unquie art of spontaneous comedy! $10 cash entry at door. BYO drinks and snacks. Some mature content recommended 12+). Doors open at 7pm. $5 cash entry at door. Doors open at 3.30pm. Start your April Fools weekend with an evening of Comedy Improv! Let some of Geraldton's funniest comedian improvisers entertain you with their spontaneous hilarity. $10 cash entry on door. BYO drinks and snacks. Doors open at 7.30pm. CELEBRITIES, MUSIC, DOUGHNUTS, LISTS… IT’S THE TOR-NIGHT SHOW, STARRING TOR SNYDER. The only show featuring a collection of live unprecedented conversations with people you might not know, but maybe probably should. Tor brings her own unique twist to the traditional format sparing no expense on a shoestring budget. A live variety show inspired by TV’s Late Night Hosts Jimmy Fallon and Conan O’Brein. The dynamic Canadian/Australian comedian has become a staple of the Perth comedy scene, with her own open mic comedy night at the Fremantle Comedy Factory, regular performances in regional WA, plus venturing to other places such as New Zealand, Canada, and the rest of Australia to be funny. Tor’s first Fringe World show, Dating Naked in 2016, was a sell-out show and you can expect this year’s will be just as popular and hilarious – with the addition of several doughnuts! Because doughnuts are freaking delicious. So expect surprise guests, musical performances, magic, comedy and a completely different show every single night. Because It's not just any night, it's TOR-NIGHT! You know that smell you smell when you walk into a teenage boy's room? It's a very specific smell isn't it? Almost like something died. Well it didn't die, but it didn't want to take the bins out like mum asked it to, so it just like... Festers. Yeah well prepare for 50 minutes of that. Sit back as these three young guns of stand up comedy try their best to pine for your attention just like your own kids do. But don't give them the attention, give it to us, please. And if we sell out a show, Jackson's mum said she'd give him this weeks allowance early so we can go to chicken treat. The odds are never in your favour. Want to find out the secret to successful parenting? So do we! Think half quiz show, half infomercial and half musical extravaganza! Maybe with a little making it up as we go along- after all is that not what parenting is all about? So leave the kids with the bloke you once met in Bunnings and get ready to laugh through the tears. Join Geraldton comedians Derek John, Mark Canny, Jody Quadrio, Kim Canny and guests Elliot Brown, Tara Hall through an experience of relief as they break down the fundamentals of parenting. This show is not just for parents, just anyone who has at some point been a kid with parents. Our best talent is grown right in Regional WA. This brand new show is set to hit Fringe by storm bringing together an almighty line-up of Regional WA’s best performing artists. Expect to see a variety of incomparable pieces performed across a number of mediums from the regional all-star entourage – featuring everything anything from comedy to theatre. Fresh regional talent packaged for your enjoyment. Produced from the midwest, peel, goldfields and southwest of WA. The Regional Produce Show has pulled some the best regional artist from across WA to perform on the world stage of Fringe World. An Incompetent Life, a short look into a life that could've gone a bit better. Brian Poller looks at life just a little bit differently; using incompetence to gain success – or at least one version of success. This one man show has been more than 50 years in the making: a soaring saga of disaster and comedy; inanity and depth. In Brian’s world, competence may lead to success and money but incompetence is a short cut to seeing things a little differently if only out of necessity. Find out what the Red Rubber Thing has to do with loss, how reticulation can only be managed from the inside and about a few other things that can’t be mentioned here due to….er……incompetence! If you are thinking ‘what is Funtavia?’ then this is the show for you. This show will not only feature international, national and local performers along side each other. Special featured acts will also be on stage for this once off performance from the "Outer Fringe Tour" showcasing the best of Perth Fringe World. This show is exceptional value for money, offering previews of a number of Fringe World’s national and internationally renowned artists and dynamic performances. Expect to see sensational performances in comedy, circus, theatre, dance, music and musicals, suited for all ages – this is one show you don’t want to miss! Tickets from $18 in Mandurah and $16 in Geraldton. The National Hotel Fringe Comedy Showcase is a selection of 'comedy greats' from across FRINGE WORLD performing weekly at the historic National Hotel. Line-ups will feature some of the funniest touring national and international comedians in the heart of Fremantle. Come and enjoy a laugh in the heart of Fremantle inside the beautifully restored National Hotel. Limited unreserved seating is available. Tickets from $21 for Northbridge shows and $16 for Fremantle and Geraldton shows. Join The Comedy Emporium this January and achieve a realistic new year’s resolution – be happier, laugh more...and see live comedy at the Make Place in Mandurah! People place so much pressure on themselves around this time of year with their resolutions, like losing a million kilos, keeping the house spotlessly clean, paying my taxes on time. Why not just commit to being happier and achieve that goal by starting with something fun – like joining us for our New Year’s Resolution Show this January. The Comedy Emporium’s New Year’s Resolution Show will be at the Make Place in Mandurah on January 7. Doors open with live music starting at 7pm and comedy starting at 8pm. BYO food and drinks. Tickets are available online at www.thecomedyemporium.com for just $20 until then end of 2016. Then presale tickets are $25, and $30 if you buy on the door. Sounds like a perfect Christmas Present for someone, doesnt it *wink wink *nudge nudge. Join The Comedy Emporium for their annual Beach Party Show under the stars this January. “There’s nothing else to do in January.. except hang out with your family - and you’ll be sick of them by the New Year!” said Comedy Emporium Ringleader, Julian Canny. Audience members are actively encouraged to wear beach attire as the night will feature heaps of crazy beach themed antics. There will be competitions, like the infamous “worst Hawaiian shirt” and “thong throwing” competition which had the crowd in stitches in previous years. The show will be held in one of The Comedy Emporium’s favourite venues - open air at the Queens Park Theatre in the Amphitheatre. Audience members are encouraged to bring a picnic and spread out on the grass stairs. “Realistically, this is probably the only show you can wear your pluggas to and get away with it” hints The Comedy Emporium's Regional Producer, Emma Howell. “Look, you can even bring your partner along and have some quality time, with the added bonus that you don’t have to talk to them, just sit back and laugh!” adds Julian. Strictly NO BYO, bar opens from 6:30pm Doors Open, 7pm Live Music, 8pm Comedy. Bring a picnic. Early Birds prices end on 30th December at 5pm. Event Nation and The Comedy Emporium are again treating Geraldtonites to two nights of belly-grasping hilarity with their annual Christmas Comedy Feast on Friday and Saturday December 16 and 17. Let our Young Guns Improv Troupe save you from all the bad cracker jokes this December and get you into the festival spirit at the Young Guns Comedy Improv Christmas Special. The Young Guns show is set for 7.30pm on Saturday the 10th of December at Pollinators City Hive, Geraldton. Doors will be open from 7pm. If you haven’t seen live improv comedy before you’re in for a christmas treat as this is your chance to see some of Geraldton’s best young comedians live in action. The show is guaranteed to be the best Santa-sack full of laughs this festive season. So dont be a scrooge, grab yourself a ticket for just $10 for Adults and $5 for Students. Tickets for parents of players are free. BYO Drinks. For more information contact The Comedy Emporium Ringmistress Jody Quadrio at jody@thecomedyemporium.com. Let our Prodigies Improv Troupe save you from all the bad cracker jokes this December and get you into the festival spirit at the Comedy Improv Christmas Special. Featuring the best Santa and his Prodigies comedy battle this side of the North Pole, as well as a number of other festive favourites. 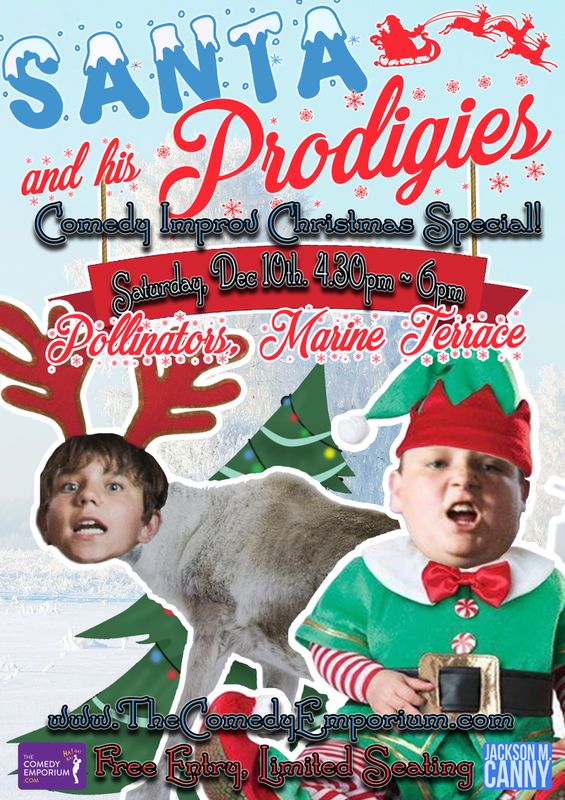 The Prodigies show is set for 4.30pm on Saturday the 10th of December at Pollinators City Hive, Geraldton. Doors will be open from 4pm. Entry is free. The show is guaranteed to be the best Santa-sack full of laughs this festive season. Let our Adults 18+ Improv Troupe save you from all the bad cracker jokes this December and get you into the festival spirit at the Comedy Improv Christmas Special. Featuring the best Naughty vs Nice comedy battle this side of the North Pole, as well as a number of other festive favourites. The 18+ show is set for 8pm on Friday the 9th of December at Pollinators City Hive, Geraldton. Doors will be open from 7.30pm. BYO Drinks. If you haven’t seen live improv comedy before you’re in for a christmas treat as this is your chance to see some of Geraldton’s best comedians live in action. The show is guaranteed to be the best Santa-sack full of laughs this festive season. So dont be a scrooge, grab yourself a ticket for just $10. Get ready to fall off your seat from laughter at The Comedy Emporium Geraldton October Showcase as part of the Festivals on the Foreshore. Featuring a variety comedy show in one of Geraldton’s newest venues, this is one show you won’t want to miss! The night of hilarity is taking place at the Geraldton Multipurpose Centre on the foreshore at 7pm on Friday October 7. Doors open from 6.30pm. This is an 18+ show, but Julian forgot to get us a liquor licence...so it is BYO booze! Yay?! Food will also be available outside in the Twilight Dinner Market. There is only 100 tickets available for this show so get in quick to avoid missing out. Tis’ the season to be laughing as our Young Guns Improv Troupe (14-17yr olds) take the stage for a hilarious, not to be missed, Spring Improv Comedy Show-down. If you haven’t seen live improv comedy before you’re in for a treat as this is your chance to see some of Geraldton’s best young comedians live in action. Live improv comedy is so much more than one liners…imagine whole scenes of hilarity coming together at whim…where the plot, characters and dialogue of comedic scenarios are made up in the moment. The Spring Comedy Improv Show-down – Young Guns Troupe is taking place at 7.30pm on Saturday 10th of September at Theatre 8, Geraldton. Doors will be open from 7pm.